Somewhere in the south-eastern part of Central Europe, bathed by the waves of the Black Sea and bordered south by the Danube, girt by the arch of the Carpathian Mountains, stands for over 2,000 years, one of the most beautiful countries. In the context of Romania taking over the Presidency of the Council of the European Union on January 1st, 2019, Romfilatelia invites you to discover, in the postage stamp issue named Romania, a European Treasure the indisputable values of our country, which has come to the fore both in Europe and in the whole world through its rich cultural, spiritual and scientific heritage. 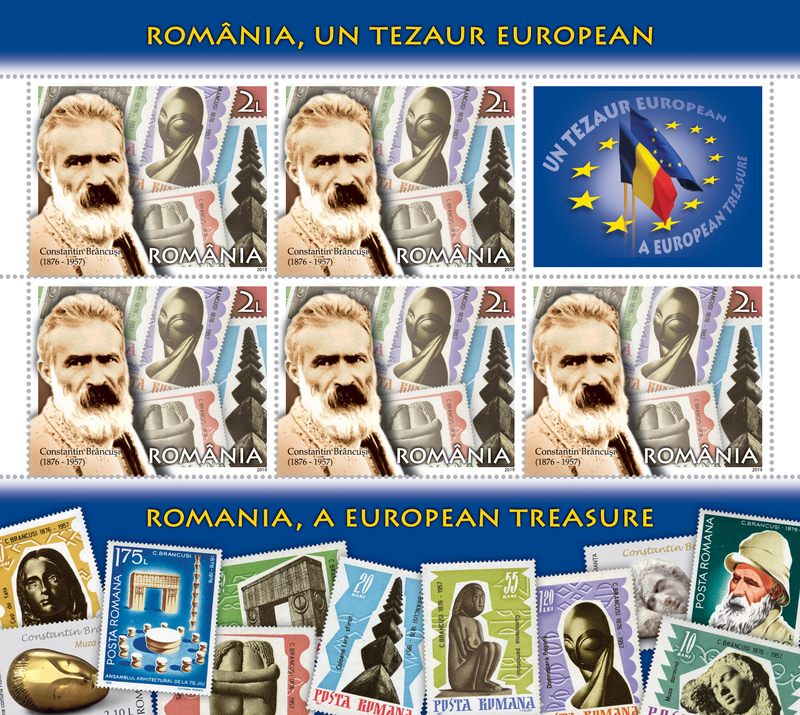 On the stamp with the face value of Lei 2, you will discover the personality of the greatest Romanian sculptor, who marked the twentieth century, titan of world art, Constantin Brancusi (1876 – 1957), along with some of his works illustrated as stamps. Adept of the modern abstract sculpture, Brancusi influenced and revolutionized sculpture in a defining and unanimously recognized manner. His works in bronze and marble are characterized by a pure, elegant and retained form, but also by a refined finish. Passionate about wood sculpture, he has performed many works, some of which have folkloric inspiration, and often carved prototypes in wood for works later executed in other materials. Brancusi’s international recognition came quickly, and his works, such as Bird in Space, Mademoiselle Pogany (Miss Pogany) or Princess X, have become his passport for the great sculpture exhibitions in the world. An exceptional creation is the brilliant sculptural complex of Targu Jiu, dominated by the Endless Column. The National Museum of Modern Art in Paris, housed in Centre Pompidou, hosts a large number of works by the artist. 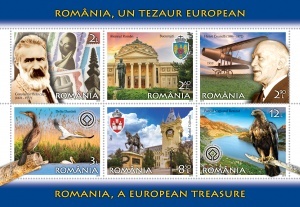 Bucharest, part of the historical province of Muntenia, mentioned for the first time 560 years ago (in 1459) and capital of Romania since 1862, important political, economic, commercial and tourist centre, is distinguished by its architecture, reflecting the varied history of the city through a harmonious blend between traditional and modern. In the interwar period, French influences in the culture and elegant architecture of the city brought it the appellation of “Little Paris”. 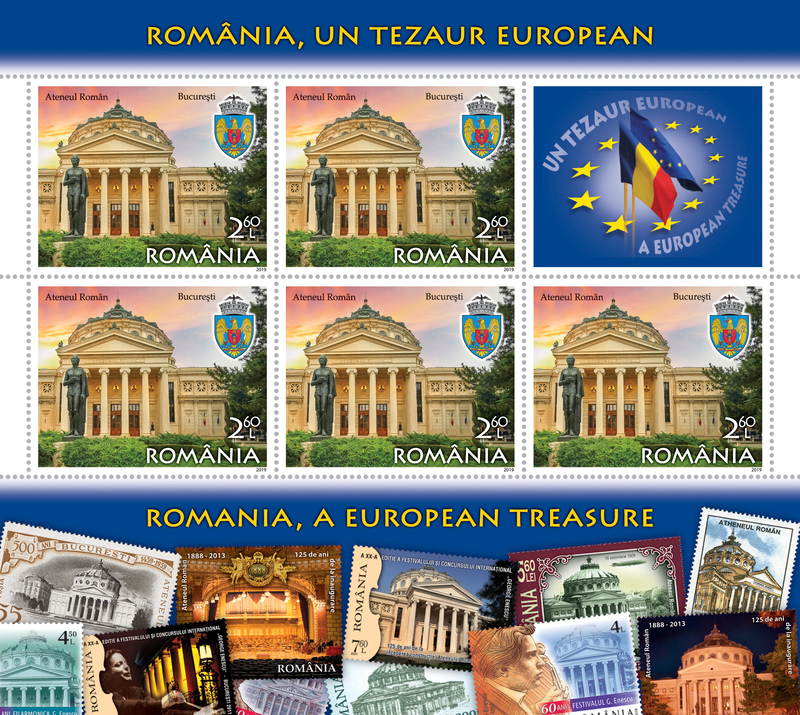 The Romanian Athenaeum, built in a Baroque style between 1886-1888, a monument included in the European Heritage List, one of the most beautiful buildings of Bucharest, symbol of the Romanian culture, which today hosts “George Enescu” Philharmonic, is represented on the stamp with the face value of Lei 2.60 The decorative sculptures made by Italian and German artists, the vast lobby with the twelve Doric pillars of metal covered in faint pink stucco, as well as the four interior stairs leading to the concert hall, impress by glamour. Also, the façade of the building exposes medallions made in mosaic with the figures of some outstanding rulers: Alexander the Great, Neagoe Basarab, Vasile Lupu, Matei Basarab, as well as the figure of King Carol I. 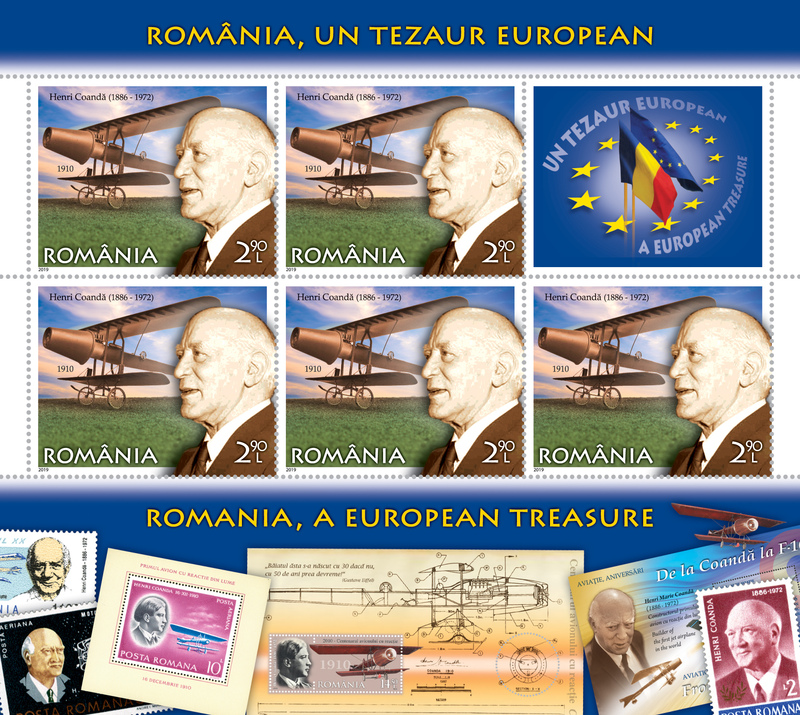 Considered one of the greatest inventors of the twentieth century, who revolutionized the aeronautics industry, Henri Coanda (1886 – 1972), a Romanian engineer and physicist, is illustrated on the stamp with the face value of Lei 2.90. Throughout his career, Henri Coanda came to the fore by his amazing creativity, embodied in over 250 patents, with applications in the most diverse fields that have brought him numerous international awards and academic titles. At the Second International Aeronautics Salon in Paris in 1910, he exhibited his turbopropeller, the first reactive jet, the frontrunner of today’s turbojet aircrafts, through which Henri Coanda became the parent of jet engine aviation. During the First World War, he invented hydrocarbon tanks made of reinforced concrete. He also discovered the béton-bois material for construction prefabs, a list of his inventions also including the non-recoilless gun from the military aircraft equipment, the design of a seawater desalination plant, etc. Coanda’s celebrity is due to the discovery of the effect of the fluid mechanism, which today bears his name. Thus, the Coanda Effect, patented in 1934 as the Procedure and Device for Deviating a Fluid into Another Fluid, revolutionized aeronautics. Academician, engineer, aviation pioneer and inventor, member of the Royal Aeronautics Society in London and of the Romanian Academy, Doctor Honoris Causa of the Polytechnic Institute of Bucharest, Henri Coanda died on November 25th, 1972. The youngest land of Europe, the Danube Delta, the gift the river offered to Romania, entered the UNESCO World Heritage Site in 1991, as a Biosphere Reserve. The area includes one of the world’s largest wetlands, with over 400 lakes, oak and ash forests, sand dunes and wild beaches on the delta seaside. In the Delta, a varied and dense aquatic flora has developed, the main arm reaches of the river being bordered by a wide curtain of willows, while on the dry portions (sand banks), hardwoods such as oak, ash, and field maple have developed. In this exotic land with over 1,800 species of trees and plants, Letea Forest distinguishes, as the oldest natural reserve in Romania, which covers about 3,200 hectares. Considered the “little jungle” of the Danube Delta, this is the northern subtropical forest and the unique place where lianas are found in Europe. The fauna of the Delta is particularly rich, with over 300 species of birds, of which over 70 migratory species – cormorant, pelican, stork, swan, goose and wild duck – about 40 mammalian species – wolves, boars, foxes, otters, minks etc. – but also over 130 species of fish, an important source of food for birds and aquatic mammals, as well as an important scientific and economic resource – sturgeon, beluga, sterlet, mackerel, zander, pickerel, etc. 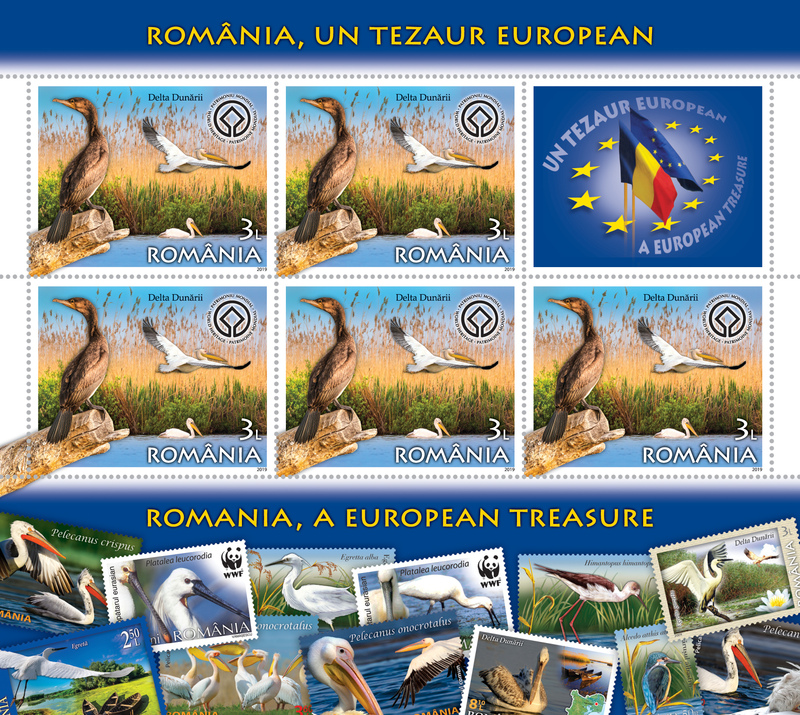 The stamp with the face value of Lei 3 features one of the wonderful landscapes of the Danube Delta. 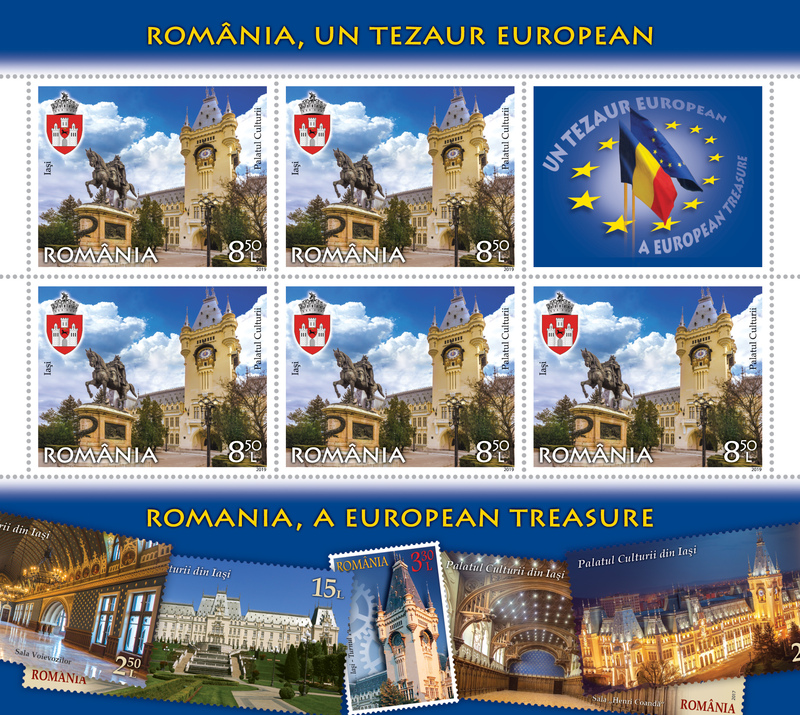 The city of Iasi, the historical and cultural landmark of the Romanian people, the place where over 160 years ago appeared the first Romanian postage stamp, the famous aurochs’ head, houses in its centre a real architectural jewel, the Palace of Culture, illustrated on the stamp with the face value of Lei 8.50. Originally known as the Palace of Justice and Administration, the building is designed in the style of the communal palaces of Western Europe, combining several architectural styles: Neo-Gothic, Romantic and Neo-baroque. The three-quadrant clock in the tower of the building, decorated with small pieces of stained glass representing the twelve zodiac signs, is framed by “plaiesi” (border rangers) in national folk costumes, according to the model of the soldiers painted at Peles Castle. Nowadays, the Palace of Culture in Iasi is home to “Moldova” National Museum Complex, where are four other national museums – the History Museum of Moldova, “Stefan Procopiu” Museum of Science and Technology, the Museum of Art and the Ethnographic Museum of Moldova. 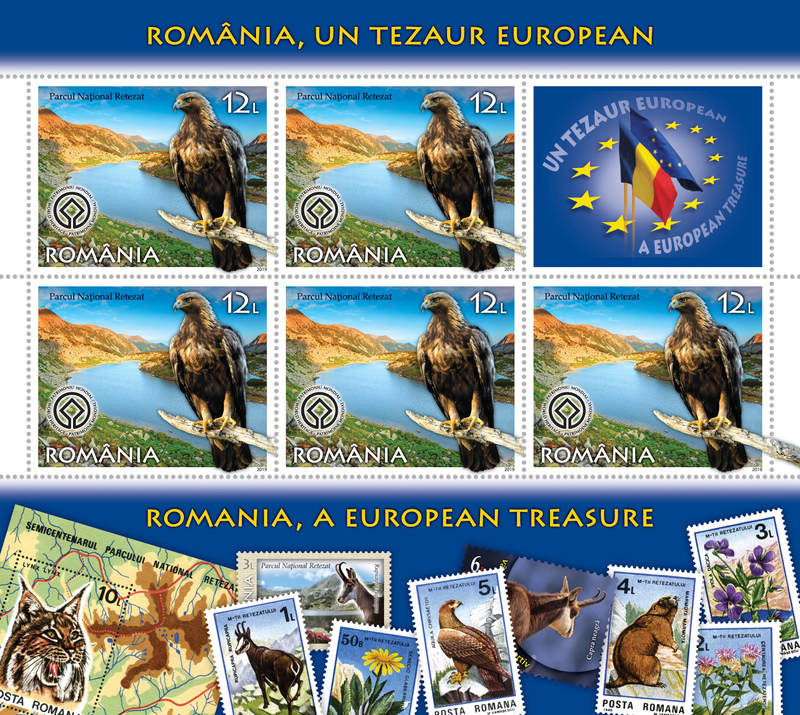 The stamp with the face value of Lei 12 illustrates the most important mountain nature reserve in Romania, Retezat National Park. The MaB (Man and Biosphere) UNESCO Committee at the 6th session of the Man and the Biosphere (MAB) Programme International Co-ordinating Council (MAB-ICC), Paris, 1979, designated Retezat National Park as Biosphere Reserve, confirming once again the invaluable wealth of our country. Places still unspoiled by humans, over 20 peaks higher than 2,000 meters, 80 lakes and tarns mirroring the blue sky, flowers, glaciers, caves, wildlife, widespread forests – all gather in a world humming with life, in a unique monument of nature: Retezat National Park. 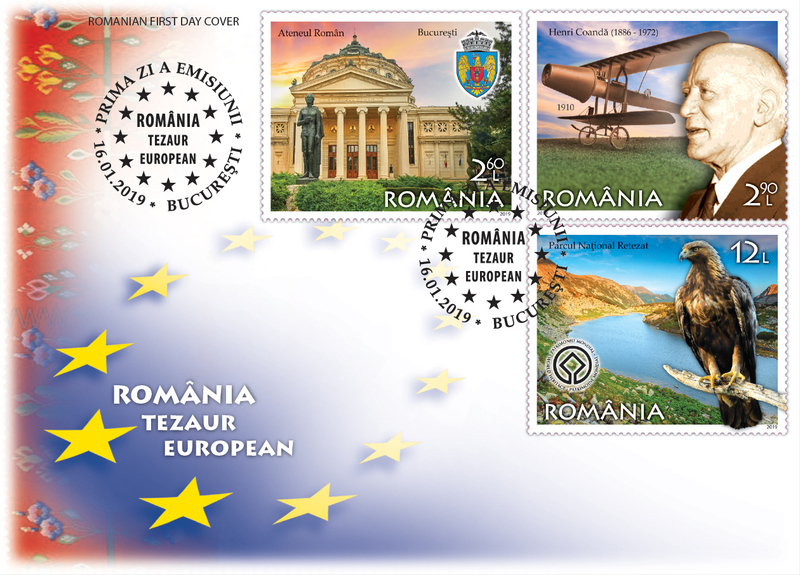 The postage stamp issue Romania, a European Treasure will be available on Wednesday, January 16th 2019, in Romfilatelia’s shops network in Bucharest, Bacau, Brasov, Cluj-Napoca, Iasi and Timisoara and online on http://romfilatelia.ro/store/. 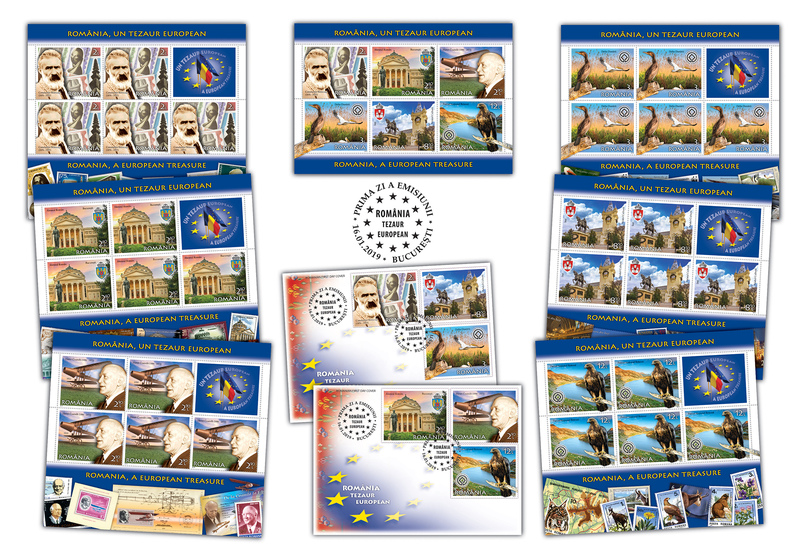 The postage stamp issue is completed by the 2 “first day” cover, as page composition in sheet of 20 stamps and minisheet of 5 stamps + 1 label and 1 block of 6 perforated stamps. 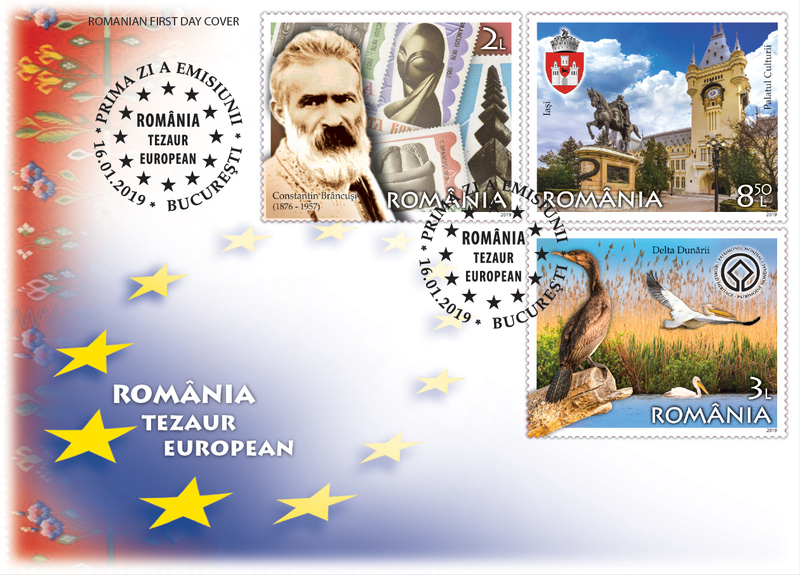 Romfilatelia thanks the Romanian National Commission for UNESCO for the documentary support granted for the achievement of this postage stamp issue.